You are here: Home / Medical Studies / Why is there an increased risk of suicide for those with fibromyalgia? 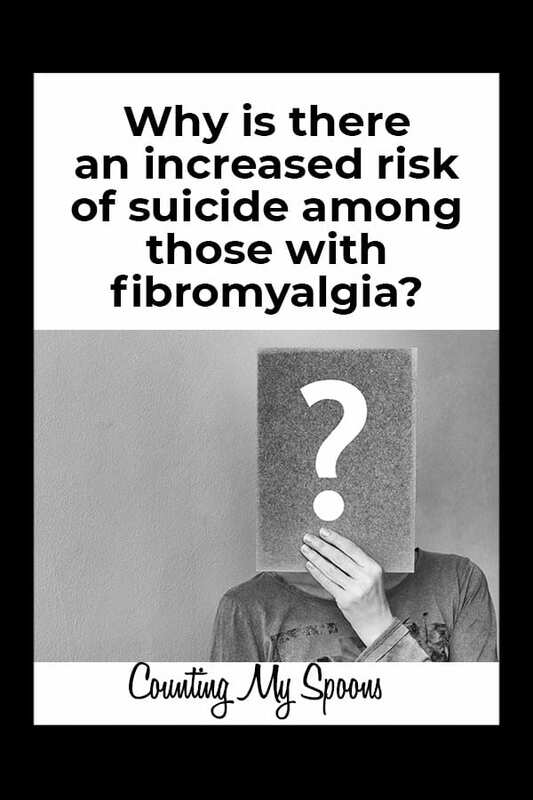 I’ve looked at several studies that have shown that while there is not an overall increase in the risk of death for those with illnesses like fibromyalgia and migraine, there is an increase risk of suicide. Why is there an increased risk of suicide for those with chronic pain? When you read the question it almost seems like it answers itself. A 2010 Danish study found that the risk of suicide among those with fibromyalgia was about 10-fold. That’s a pretty big number. The risk is highest immediately after diagnosis and for the first five years. A 2015 study looked at patients with migraine and found that the risk of self-harm was almost 50% higher for those with migraine than those without. Fibromyalgia and migraine are not mutually exclusive. In fact, they are comorbid, meaning that they are likely to appear together. About 17 percent of patients with chronic migraine also have fibromyalgia, according to another 2015 study. According to that same study, the risk of suicidal thoughts and actions almost doubles for those with both fibromyalgia and migraine, compared to just migraine alone. As someone who lives with both, I can’t say I’m ever surprised by these studies. The study points out that those with both fibromyalgia and migraine report more severe symptoms, overall, including depression, anxiety, and poor sleep quality. In 2012 I went through a severe bout of depression. I can’t say how much was caused by my illness and how much may have been caused by some of the medications I was taking. Unfortunately, many anti-depressants have side effects of increased depression and even suicidal thoughts/tendencies. So, why is the risk of suicide higher among those with fibromyalgia? The obvious answers would seem to be depression/anxiety, higher psychiatric distress, increased functional disability, and poor sleep. However, even when the study controlled for these symptoms, the risk was higher among those with fibromyalgia. So, what does that leave? The researchers next point to studies linking helpless, hopelessness, pain catastrophizing, and problem-solving deficits to increased risk of suicide when chronic pain was involved. Additionally, they point at the differences in how the fibromyalgia brain responds to stress. Recent studies have found that certain proteins involved in stress response are less expressed in those with mood disorders. As I think about my experience with depression and suicidal thoughts, I would say that hopelessness and helplessness definitely played a role. After months of trying so many different medications that only seemed to make me feel worse. I did feel hopeless that I’d ever get better. I felt like a failure. I felt helpless to do anything to improve my situation and if that was to be my life forever I saw no reason to keep going on. Pain catastrophizing is a negative mind-set wherein you get focused completely on your pain. You ruminate on the pain, thinking of little else, you magnify your pain, and generally believe it won’t get better. This would lead to both hopelessness and helplessness. But, it’s not that simple. It’s a bit of a catch-22. It’s also really hard to say that someone is magnifying their pain. However, studies do show (and I believe) that the more we focus on the pain (ruminate) the more we tend to feel/notice that pain. If all you are thinking about is pain, you are going to hurt more. I think that issues with coping techniques and problem-solving could definitely be linked to hopelessness/helplessness as well as the increased risk of suicide. There are a few studies on fibromyalgia and coping methods pointing out that those who use active coping methods and who try to take charge of their treatment tend to have better outcomes. It makes sense, if you feel you have control, you’ll have better outcomes. You’ll feel more positive in general, and likely be less depressed. I don’t explain any of this to discount the likely biological implications. First off, we still don’t know the extent of the biological changes that come with fibromyalgia. But, study after study has found brain differences in how we process pain, stress, and even depression. I don’t have the answer to why the risk of suicide is so much higher among those of us with chronic pain, especially fibromyalgia. I don’t think there is one single answer… but I can definitely understand why the numbers look the way they do. If you are struggling with depression and suicidal thoughts, please know that things can get better. Keep looking for answers and reach out for help. You can call the suicide prevention lifeline at anytime 24/7 at 1-800-273-8255 if you need someone to talk to. Visit their website for more ways to contact them including online chat and special lines for the deaf and hard of hearing. This is the first time I reply to a Fibro-Report, because it is so actual and includes almost everything I have experienced since I have been diagnosed with Fibro 19 years ago (after searching for about 10 years for the reasons of my health problems with all the pain). In those 10 years I was laughed at and no doctor knew anything about Fibro, for them I was a patient for the psychiatrist. But back then, the effects were not quite as extreme as they are today. After the rheumatologist made the diagnosis of Fibromyalgia, the first medication was Amitryptilyn, which I took for years completely for nothing, the only thing that “worked” was the side effects. I tried to find another doctor, but there wasn’t anybody who knew something about the right treatment and they still kept telling me to visit a psychiatrist. Unfortunately, I also have a very severe osteoporosis, which has already caused 2 lumbar vertebra fractures, multiple herniated discs, and a migraine since I am 15 years old. So all the good advice to improve the Fibro, like a lot of sports and exercise are not feasible because of the other diagnosis. But I still have tried everything else I could and have read about by myself. The Fibro just got worse and worse over the years, I just found myself in the video with every single issue, every feeling, every pain. I stopped taking Amitryptilyn and at least the side effects were gone too. A pain therapist where I was sent to 5 years ago started giving me Lyrica and morphine and the pain went down to a just bearable level on about 50% of the time, but it was more the back pain from the other diagnosis as from the Fibro pain. Getting up every morning is like hell for the first 2-3 hours, sometimes I just don’t want to go on anymore. On some days the pain even goes on all day through and I need help for the simplest things, like going to the bathroom. The “worst” part are those “good friends” with their ‘oh so good advices’, most of them have NO idea what it’s like and can’t understand or imagine what I feel. I even lost a few because sometimes I could not keep an appointment, but I’m up to that point, I don’t care about people like that anymore. As you all maybe can imagine, in all those long years I have really tried everything, but nothing works for me. So I have to live with this crap, if I like it or not. I want to thank you so much. This blog is the only fibro blog that I follow now because “you” actually post important information on helping cope our condition. (I have a diagnosis of fibro, chronic migraines, and chronic insomnia.) I used to also read FibroMomBlog and just got fed up and quit because all she does is constantly push products in your face with every post and pain catastrophize. She spends so much time bellyaching over the pain that I find reading her is like a trigger and so very not helpful. Thank you for writing posts with useful studies and supportive information. Lianne, you’re welcome and thank you for reading it. I know what you mean as I found that the more I focused on pain the worse it felt. Focusing on solutions to the physical and mental pain we deal with has helped me more and I hope it helps you. Please reach out any time. I worried a bit about this post as I know it could trigger negative thoughts, but I think it’s an important topic that doesn’t get addressed much.